use ponoko. It is easy to get the profiles cut unless you have a better deal close to you. Any route you follow you can download the schematics directly from ponoko even thou it as I have built already one device I would most definitely not go for the plexiglass cut! It is extremely brittle. And you have an insane amount of screws. It is like a hammer made of glass: beautiful but useless. I bumped into this one after I actually made the printer, it does not have an extruder taking plastic wires like other printers! There is an option describing how you can hack a makerbot extruder! And it will give you so many headaches you would wanna quit. If anyone is interested I can share the designs of my double extruder that I made for the printer… I’m not sure anyone needs them. I can make them available with parts and solidworks design. Hi, i’m very interested in your extruder designs. 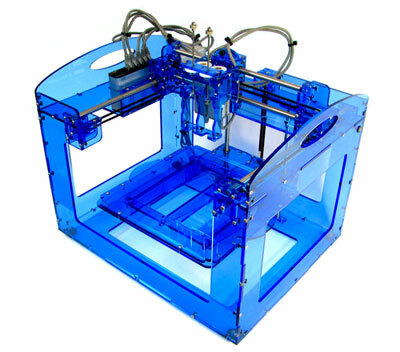 This printer is cool, but need a plastic print head like makerbot. Thank you for making these files available! My senior design team is using the Fab@Home model 2 printer. We are having many problems, most notably the inability to print a nested part made of 2 materials (e.g. a tube around a cylinder). Do you know of any possible sources for this error?